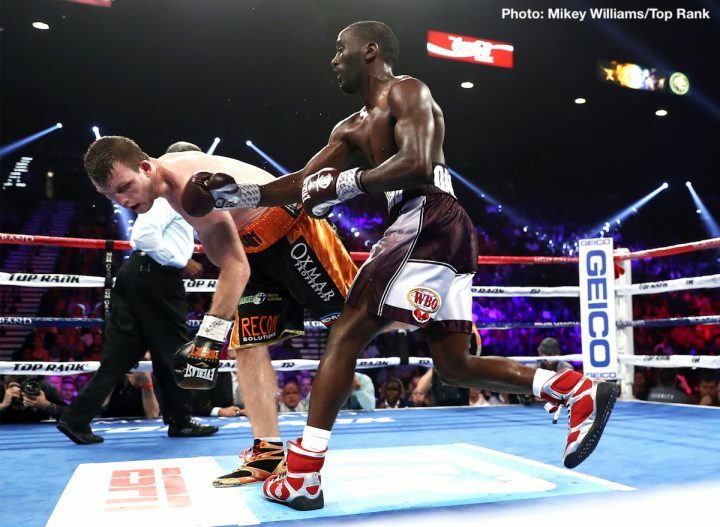 By Chris Williams: Top Rank is reportedly considering having Terence Crawford make his first defense of his WBO welterweight title against Jose Benavidez following his win over Jeff Horn last Saturday. Benavidez (27-0, 18 KOs) is in the same Top Rank stable as Crawford, which makes the fight between them an obvious choice. Benavidez, 26, is the older brother of WBC super middleweight champion David Benavidez, but thus far he’s not made the same type of impact with his career. Hopefully for Crawford’s sake, he doesn’t end up fighting Benavidez next. Crawford needs to be facing better opposition than this. Even if Top Rank has to look in other divisions for opposition for Crawford, they need to do that so that he can fight quality guys each time. The Top Rank promoted Benavidez is not a great choice for Crawford to be fighting, but this might be as good as it gets for him. Crawford’s last fight against the Top Rank promoted Jeff Horn was an in house fight. Keeping fights in house removes any chance of the WBO welterweight title going to a fighter promoted by another promotional company if Top Rank were to match Crawford against a fighter not signed with them. Crawford has enough talent to beat most fighters in the welterweight division, but why risk it by matching him against a non-Top Rank guy? The downside of Crawford being matched against guys from his stable is his career growth may wind up being limited. If Crawford is going to be pitted against fighters like Benavidez and Konstantin Ponomarev instead of the better known fighters, he’s not likely to increase his popularity with the boxing public. Benavidez defeated Frank Rojas (22-1, 21 KOs) by a 1st round knockout last Saturday night on the undercard of the Horn vs. Crawford fight at the MGM Grand in Las Vegas, Nevada. Benavidez isn’t a huge puncher though. Benavidez’s win over the 31-year-old Rojas was more of a case of a case of him fighting a weak opponent with an inflated record. Benavidez is ranked #6 by the World Boxing Association at 147. He’s not ranked by the other three sanctioning bodies at welterweight. The only recognizable fighter on Benavidez’s eight-year pro record is Mauricio Herrera, who he beat by a controversial 12 round unanimous decision in December 2014. Benavidez didn’t look good against Herrera, and he was lucky to get the victory. The scoring of that fight was not in sync with what took place inside the ring. Herrera was the better fighter throughout, but the judges scored it for Benavidez. The scores were 116-112, 117-111 and 116-112. Benavidez was the A-side going into the match. Top Rank has put Benavidez in against lesser fighters since then in matching him against Frank Rojas, Matthew Strode, Francisco Siqueira and Jorge Paez. Crawford vs. Benavidez is a fight that is a predictable one for Top Rank to make, as the boss for the company Bob Arum likes to make a lot of in house fights involving fighters from his own stable. Crawford took advantage of a weak champion in beating Horn (18-1-1, 12 KOs) by a 9th round knockout at the MGM Grand in Las Vegas, Nevada. Horn won the WBO welterweight title last year in beating former 8 division world champion Manny Pacquiao by a 12 round unanimous decision. Pacquiao was fighting Horn in his hometown of Brisbane, Australia. You can argue that the win for Horn turned out to be a good thing for Top Rank, as it helped make a bigger name out of the Australian fighter. Unfortunately, Horn’s loss to Crawford has hurt his popularity because of how bad he looked in losing.